Dave Trott is currently Chairman of The Gate London. Part of The Gate worldwide, it has offices in New York, Hong Kong, Singapore, Edinburgh and Dublin. As part of the creative team behind ‘Hello Tosh Gotta Toshiba’, ‘Ariston and on and on', the Cadburys Flake ads and many more, Dave’s former agency Gold Greenlees Trott was voted Agency of the Year by Campaign Magazine, and Most Creative Agency in the World by Ad Age in New York. In 2004 he was given the D&AD President’s Award for lifetime achievement in advertising. Powerful strategies for how to out-think the competition, from one of the true greats of the advertising world. Two explorers are walking through the jungle. One explorer sits down and takes a pair of running shoes out of his backpack. Predatory Thinking involves looking at a challenge you can't solve and getting upstream of it - changing it into a challenge you can solve. 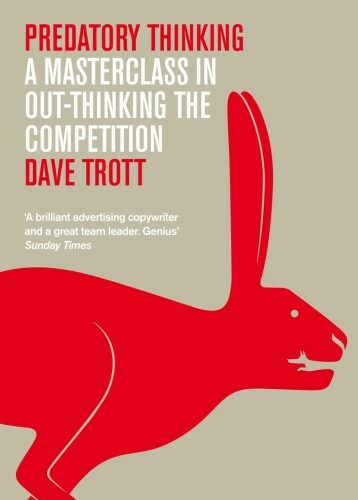 Written in the form of engaging, brilliantly lean anecdotes and stories, it is the philosophy that has underpinned Dave Trott’s distinguished career as a copywriter, creative director, and founder of some of London's most high-profile advertising agencies. Drawing on Eastern and Western philosophy, and colourful characters that range from Second World War fighter pilots to Picasso, Socrates and Warren Beatty, this book represents the distilled wisdom of a lifetime at the creative cutting edge.